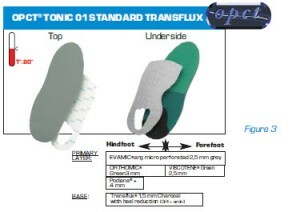 Plantar orthotics are used to enable subjects to maintain the best possible balance in static and dynamic situations. They have a major influence on the movement of the rear foot (pronationand supination) during running and walking. Running is fundamental to all sports in physical preparation, and the runner population, in general very heterogeneous, will consult a podiatrist. Plantar orthotics have been shown to be extremely effective in lesions caused by running (Eggold, 1981; Kilmartin and Wallace, 1994). Furthermore, the wearing of orthotics is thought to increase shock absorption during initial contact (Redmond et al., 2000). The reasons for this population consulting a podiatrist can be categorised into two types: a desire for more comfort, particularly “cushioning”; and pathologies connected with the practice and/or age of the subjects. Two pathologies appear to account for the majority of consultation requests: gonalgia and calcaneal tendinopathies. It is in this context that we chose to evaluate the impact in terms of satisfaction, pain, perspiration and perception of stability of two types of thermoformed plantar orthotics. This technique is widely recognised in sports podology (Boissinot, 2007) and has a number of advantages: better stabilisation of the rear foot (Rodgers, 1999), better load distribution (Berger et al., 2005) and easier adaptation in athletes (Mündermann et al., 2003) have been demonstrated and are evidence of the positive influence of moulded orthotics on the running pattern. 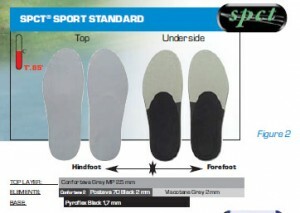 Moulded orthotics reduce the maximum overpronation of the rear foot and the maximum external rotation of the tibia. 133 patients (51 women and 82 men) were included in the sample for this analysis, with a mean age of 36.2 ± 12.9 years (9 to 61 years) and anthropometric characteristics of 1.70 ± 0.12 m, 64.85 ± 14.12 kg. The reasons for consultation were in connection with either gonalgia-type pathologies (60 patients) and calcaneal tendinopathies (50 patients) or with a request motivated by the desire to prevent injury (33 patients). 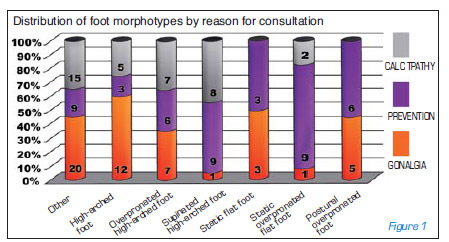 The majority of these patients presented high-arched (40) or flat (25) foot morphotypes (Figure 1). The method chosen to make the orthotics was thermopressure in the corrected position by thermoshaping. To make the orthotics, in the first instance we had to make an accurate mould of the foot using a vacuum bag. The orthotics were made malleable by heating them and then positioned underneath the subject’s feet in order to assume the foot shape. Using the windlass technique when moulding the thermoformed orthotics ensured that the rear foot and midfoot were naturally realigned (Aquino, 2003 – Photo 1 + Figure 4). (90 pairs of POs) figure 3. Each patient was asked to fill in a questionnaire after one month to record their opinion regarding comfort, perspiration, weight of the orthotics and perception of foot stability. Pain was evaluated by the question “Has wearing your orthotics had a positive influence?”. The choice of responses was yes or no. The vast majority of patients were satisfied or very satisfied in terms of comfort (90%), perspiration (93%), weight of the orthotics (95%) and foot stability (95%). In 76% of cases the orthotics appeared to have a positive influence on pain. (Figure 5) 27% of the orthotics were renewed after one year. But this depended essentially on the intensity of practice. Feet. J Am Podiatr Med Assoc2001; 91(5): 245 – 250.
appuis plantaires. Revue du podologue,2005, 5: 24-26. Boissinot P, Pierre F. Chaussures, orthèses plantaires et sports. Revue du Rhumatisme. pain syndrome. Phys Ther1993; 73: 62–70. orthoses in the treatment of lower limb Sports injuries: a review of the literature. Br J Sports Med1994; 28:180–184. extremity kinematics and kinetics during running. Clin Biomec2003, 18(3) : 254-262.
plantar pressure and force during normal gait. J Am Podiatr Med Assoc2000; 90 (9) : 441-449.
pronation in runners. J Orthop Sports Phys Ther 1999;4:86–90.